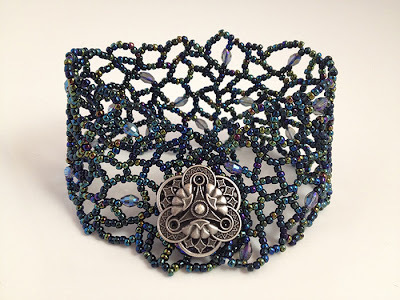 Today's the reveal for the Time to Stitch blog hop sponsored by Christine of One Kiss Creations and Therese of Therese's Treasures featuring Right Angle Weave or St Petersburg stitch. Well, it seems as if pretty much all I've done this past month is right angle weave. I've pretty much ate, drunk and slept the stitch as I worked to finish my new book and prepared for Bead Fest Texas. Mostly, I've been stitching samples for kits that I'll be taking with me to Bead Fest, then posting on my Etsy shop hopefully next week. Snowfall - an look it has sequins! Now I need to go and finish packing. But be sure to check out what the other pariticipants have done with the two stitches. I have to tell you I noticed the sequins right away- that is a lovely beaded bead. Squeal!! Love that snowflake bead! I bet that is going to be a big hit for the class. 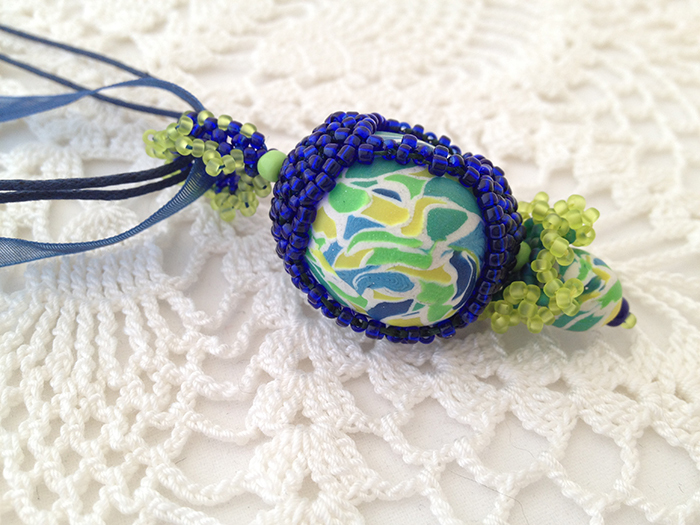 The random RAW bracelet is so beautiful, that's one on my list to try with a gorgeous bead soup I got from Nancy Dale. Wish I could be at Bead Fest to take your class, I know it would be a great learning experience! Beautiful! all your work is so gorgeous ... I really do like that cuff and can image that is looks amazing on! You know I wish I could be there with you at Beadfest and learn from your very talented self!! I love those beaded beads!!! Thank you for joining mine and Christine's challenge. I love your work you make RAW look so easy and care free. 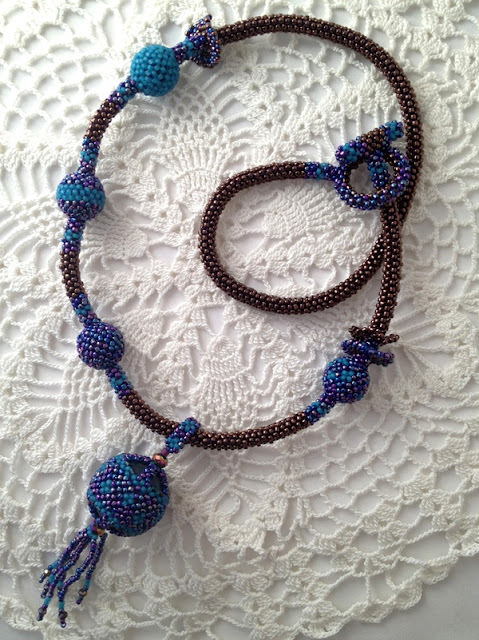 I love the beaded beads, the free form RAW bracelet, and the necklace awesome work on all. I must say I did try the free form RAW and almost finished it. I meant to take a picture and post what I started on my blog post but forgot. I hope that you will join in on the next ATTS challenge and I wish you luck and much fun in Texas. Beautiful beaded bead! I love all these pieces!!! Ohhhh love some beaded beads! And the RRAW Bracelet is abfab! I think I have to try something like that! Thank you for the inspiration! All of your beads are beautiful and I love the freeform bracelet! I've been admiring your beaded beads for a while and these are no exception. I love those little corset beads. Your freeform RAW bracelet just blows me away, though. 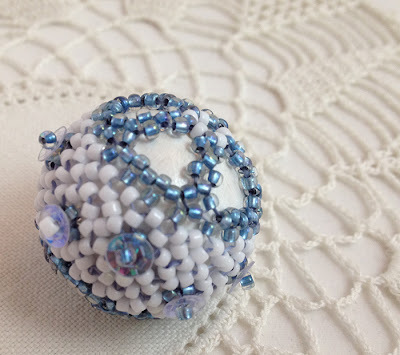 That button is a gorgeous focal and your beadwork is stunning! Please pack me in your suitcase and take me with you....along the way please teach me the corset technique---! I had just been reading about you and your corset beads!! Love the sequins and how they will sparkle!! Beautiful work and have a fun trip! My RAW guru...you got me hooked on Random RAW and then your easy instructions held my hand through the dreaded regular RAW. And now, I am pretty darn sure I get it. Thank you, Karen! Of course I am always partial to the Random RAW cuffs you make and this one is a beauty with a gorgeous button. Thanks for Hopping Karen and allowing us to post your tutorial. We really appreciate that! Have fun and best of luck with BeadFest TX ! Karen, beautiful, beautiful pieces! 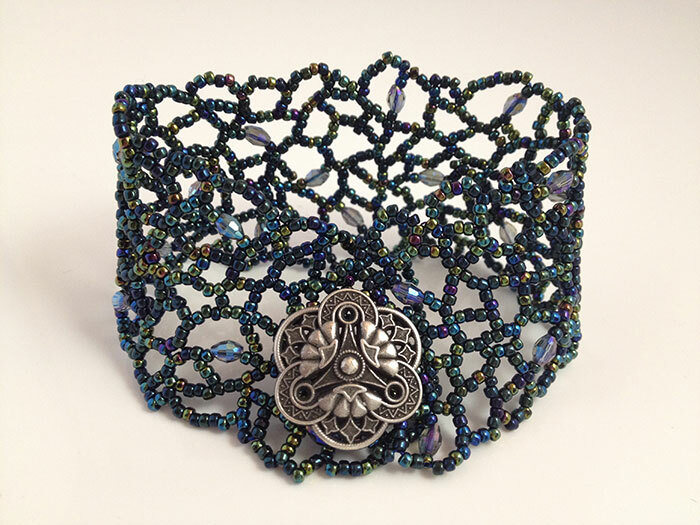 I am in love with the random freeform RAW bracelet and those corset beads are great! Your work is always so wonderful!!! You know I love anything that comes off of your needle and nymo, but the first two beads are particularly fantastic -- purple and teal is one of my all time favorite combos, and the sequins on the second are darling! I just adore beaded beads and these are lovely. How great that your entire necklace is RAW. The braclet is just Stunning, love it! Wow those are fabulous! I love a bead covered in beads! Very awesome! Your beaded beads are stunning! Congrats on the book and teaching etc. The idea of random RAW really appeals to me in a big way. I love freeform so this would be right up my alley. It is truly a beautiful bracelet. I am totally unfamiliar with random RAW, but I love the open, organic feel of that cuff. Wish there was a BeadFest Atlanta, so I could take your classes! Karen, beautiful job! I'm so excited that one of your beads has sequins on it. Would you mind if I included it in the reader gallery on my blog? I'm really intrigued by the random RAW. That's something I definitely want to try -- it's gorgeous. Also, have I mentioned how much I enjoyed the preview of your book? Your diagrams are clear and your written instructions are awesome. I know that once I get the hang of RAW, I'll have a lot of fun trying your projects! Love the random bracelet. I am going to have to give that a try! 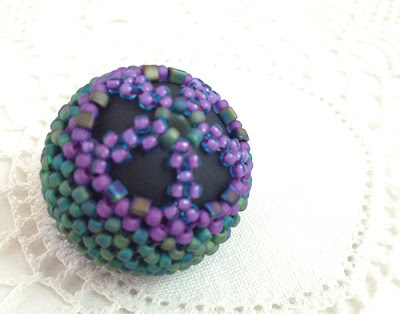 Your bead covers are intriguing and look like they would be fun to make. Since I live in Delaware, I am wondering do you sell your patterns online? I love beaded beads and yours are awesome Karen! I love the colors and patterns. Your cuff and necklaces are beautiful too!